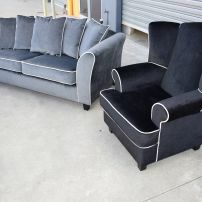 commented on "Sofas & Wing Chairs Reupholstered in Grey & Charcoal Velvet with White Contrast Piping SE Melbourne"
JARO can reupholster or make new your favourite sofa or chair. 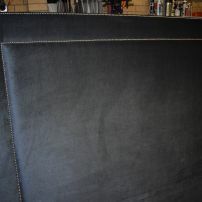 We have a great range of quality velvet fabrics to suit any budget. 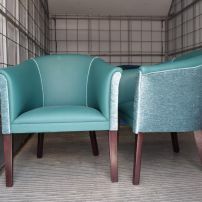 For a quote simply send through some pictures of your item to be restored or recovered to enquiries@jaro-upholstery.com.au. commented on "Arm Chair Re-Upholstery Service, Melbourne, Casey, Cardinia, Gippsland"
We have some fantastic fabrics to bring your favourite chair or sofa upholstery back to life. 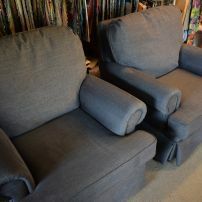 Feel free to send pictures of your furniture to enquiries@jaro-upholstery.com.au for a reupholstery estimate. 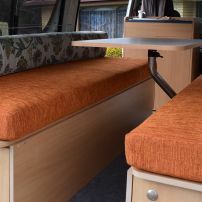 commented on "Seat Cushions for Caravans, Campervans, Vans, RVs, Motor-homes, Horse Trucks, Boats, Buses ........."
A new look for this van's seat upholstery! These custom made seats and bed mattresses came up a treat for this lovely couple who will have endless amounts of fun travelling around our beautiful country. Feeling very jealous! commented on "Charcoal Black Velvet Bed Head with Nickle Studs made by JARO"
JARO can custom make all styles of bed heads and matching blanket boxes, bench seats, bed bases and bedroom chairs. Talk to us about your requirements and we can help you make that special piece of furniture you require. We can create from your drawing! 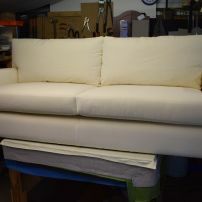 commented on "White Velvet Sofa Reupholstery by JARO"
Turn your sofa into a luxury item with velvet. So many colours to pick from. 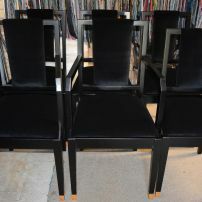 Feel free to send pictures of your furniture to enquiries@jaro-upholstery.com.au for a quote. Please indicate location if pick up and delivery are required. commented on "Navy Luxury Velvet Ottoman - Bring luxury to your home!" 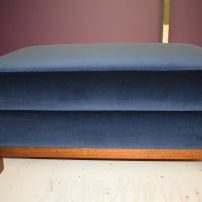 Navy Luxury Velvet Ottoman - Bring luxury to your home! JARO can custom make all styles of velvet ottomans or reupholster your existing furnishings. Pick from an amazing range of colours! 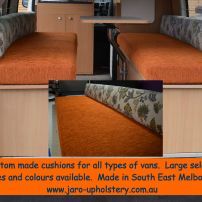 commented on "Custom made cushions for a camper van by JARO, Melbourne"
We can help you create a new look for your van, caravan, campervan or RV motorhome. Hard wearing quality fabrics, vinyls and leathers available. We can shape cushions around bends and poles where required. Email or talk to us about your requirements. 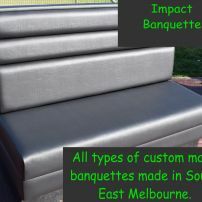 commented on "Impact stylish banquettes made in your colour and size by JARO Melbourne"
Make an Impact with new stylish banquettes made to your style and size.